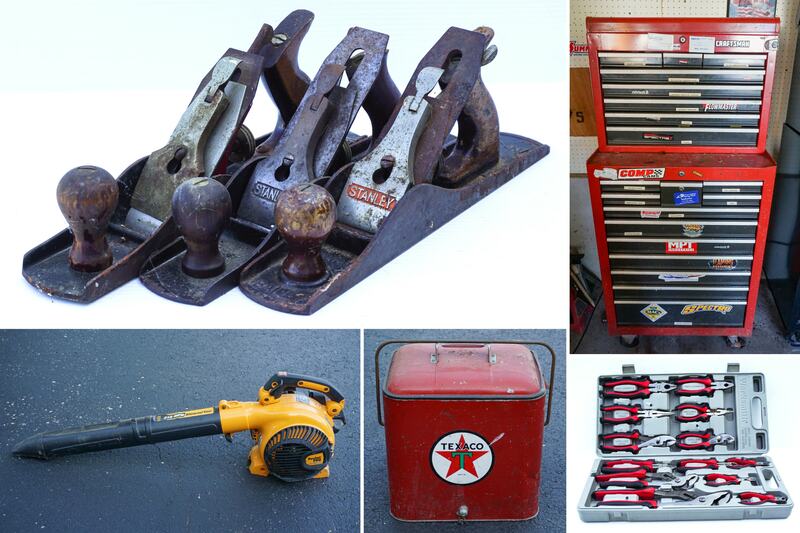 Woodworking Tools & Equipment Auction — Harritt Group, Inc. Selling live onsite the collection of woodworking equipment, tools, and collectibles for Wilma Richardson. Auction held indoors in a large garage located just off Georgetown-Greenville Road 1 block off Hwy. 150. Jet table saw with 5’ extension, Ryobi Rapid Set planer, Craftsman Professional 6 1/8” jointer planer, Professional Woodworking 4’ lathe, AMT floor drill press, Delta 9” band saw, Craftsman belt/disc sander, Makita LS1030 miter saw, dust collector, Craftsman scroll saw & Bosch router. Electric concrete mixer, Excel 2300’ PSI 6hp pressure washer, large black 2-piece rolling tool chest, red Craftsman 2-piece rolling tool chest, large woodworking bench-cabinet, Chicago sander, Chicago solder gun, Ryobi battery powered circular saw, shop vac, lawn fertilizer & sweeper, Dremel & Kreg tools, Poulan gas blower, biscuit cutter, portable spotlights, Craftsman air gun, DeWalt sawzall, battery charger, Craftsman air cleaner, Remington electric pole saw, extension ladder, wood planes, vise, (2) car buffers, tool caddy, B&D workmate, table saw lumber rollers, plastic tool vertical cabinets, stainless steel rolling table & cart, large selection of tools including wrenches, sockets, pliers, drill bits, screwdrivers, tape measures, picks, shovels, sledge hammers and mulls, wheel chock, sump pump, battery charger, air tools, electric cords, bar clamps, gas cans, LP Mr. Heater, jack stands, tarps, (3) sheets of luan, lumber, used mowing deck for Cub Cadet, shop supplies & miscellaneous items from garage. Antique oak wall phone, vintage ice chest w/Texaco logo, reproduction vintage advertisement signs & beer mirrors, Christmas villages, shadow box displays, ammo boxes, vintage Palmyra Jaycee Creed banner and more. I-64 to US Hwy. 150 Greenville Exit #119. West 8 Miles to left on Georgetown Greenville Road. 1 block south to left on Harrison Street to auction on right.